Another experiment (im glad the taste is goood...), i should slice the capsicum smaller next time :) not require much time to make this food, I never eat polenta before, but after i tried that last time, i think i fall in love again,hehehe... its filling though, like rice but taste more plain without the cheese and butter. I always try to make something new for our dinner, because on Monday, Wednesday and Friday, i got catering food delivered from Indonesian restaurant (im so lucky! ), otherways im too exhausted spending too much time in the kitchen everyday, preparing food for us (me and hubby) and my daughter. like yesterday, i made three 4 different dishes all day! 3 for my baby (so i can freeze it, and doesn't have too cook for a while), and this dish for dinner, but i still need to cook though in between those days. I will post my baby's food later on. It might sound fancy, but this balsamic-and-herb topped chicken dish will take you only half an hour to get onto the table. Season the chicken with salt and pepper. Add to the pan and cook for 7 minutes each side or until cooked through. Meanwhile, heat a non-stick frying pan over medium heat. Add the capsicum and onion, and cook for 5 minutes or until soft. Add the garlic and rosemary, and cook for 1 minute or until aromatic. Add stock, wine and vinegar, and simmer for 10 minutes or until mixture thickens. To make the polenta, place the stock and milk in a medium saucepan and bring to the boil. 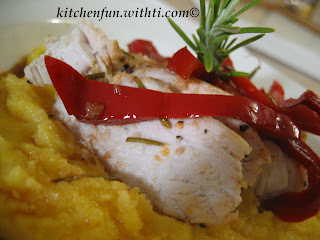 Gradually add the polenta in a thin steady stream, stirring constantly until incorporated. Cook for 2-3 minutes or until the mixture thickens. Stir in the parmesan and butter. Thickly slice the chicken diagonally across the grain. Divide polenta among serving plates. Top with the chicken and capsicum mixture. Serve immediately. Blukutuk: Wah Mas bluk, mbok ya jangan ndeso banget, nanti kalo ada bule yang kepincut sama situ gimana hayo.. kan bule ora weruh pecel toh? 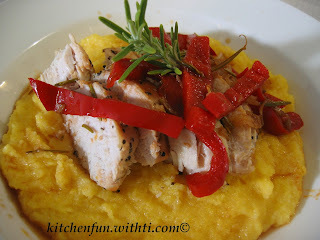 I have never cooked with polenta. I have made a cake with it and that was really good. So this too also will be good.